Beyond Organic, Jordan Rubin's new food and supplement company has the answer. The good news is you absolutely can Break the cycle of toxins and stress. Stress and excess toxins weaken the immune system, create fatigue, interfere with the digestive system, suppress cardiovascular function, create poor cognitive function, and can even create additional internal toxins. We can put a stop to this vicious cycle by attacking stress and toxins together. I believe that PraiseMoves will provide you with important stress-relieving exercise and worship which will absolutely revolutionize your physical and spiritual health. Adding the Beyond Organic “Break the Cycle Program” as outlined in the video above is something that will also add *life* to your years! I fully believe that — and have been experiencing it myself, as have several of my friends. Commit to the Beyond Organic Break the Cycle Program for an ongoing stress and toxin busting regimen. It is SO easy to do, too! Just take as directed (“I can do that!”). 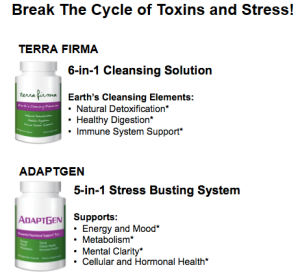 By incorporating both AdaptGen and Terra Firma into your daily health plan, you will receive incredible support towards the major challenges that rob you of vital life function. And check out the Beyond Organic foods, too. We are especially fond of the Amasai cultured dairy and cheese products as well as the Terrain Omega – changes your digestive system — and I feel like it's helped renew my youth! Go to: Visit.MyBeyondOrganic.com to learn more.